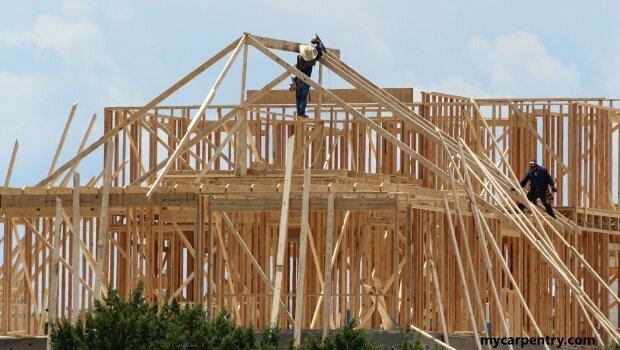 Roof framing depends on the type of roof you want to build. There are several roof types; the gable roof, hip roof, gambrel roof, flat roof, shed roof, mansard roof, and many more custom roof types. You can learn a great deal about roof framing by understanding the concepts of framing a gable or shed roof. These roof types have the basic elements of all of the other roofs and make it a perfect place to begin the discussion. The main elements of the gable roof layout are the ridge beam, common rafters, and wall plate. Roof slope is commonly represented as X in 12. For example, a roof slope that rises 6 inches for every 12 inches of run, is said to have a slope of 6 in 12, or simply "six twelve." Note: The Typical Gable Roof diagram (above) shows the (R) length measured from the outside wall to the middle of the ridge beam. 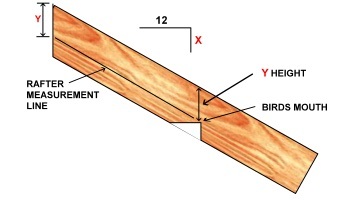 The Rafter Section diagram (below), typical of a shed or patio cover roof, shows the (R) length measured from the outside wall to the outside face of the ridge beam. Either one is acceptable, depending on which type of roof you are building, but if you are using the center-line of the ridge beam to calculate rafter length, remember to subtract 1/2 the thickness of the ridge beam. Once the ridge beam has been positioned in place and supported by roof framing members, you can determine the placement of a rafter by measuring down from the top of the beam (Y Height) and making a mark on the beam. b) use mycarpentry.com's roof pitch calculator. Remember if you are using the center of the ridge beam for your run (R) value, you need to subtract half of the width of the ridge beam to determine the length of the Common Rafter Measurement Line (L). From one end of the rafter material, using a Speed Square or Framing Square, mark an X in 12 angle on the rafter and cut it. Measure down Y Height from the long-point of the rafter cut and make a mark. This will the first point of the Rafter Measurement Line. 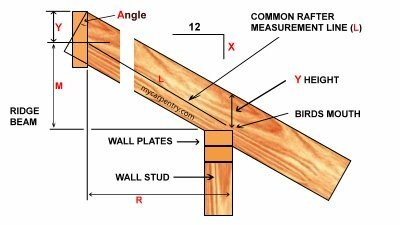 Using the results of your rafter length calculation, measure from this point along the Rafter Measurement Line to determine the location of the bird's mouth cut (see the Measuring rafter length diagram). To calculate the total rafter material length, you will need to determine how much overhang you want and add it to the rafter length calculation. Typically, you run the rafter tails longer than you want and cut them after all of the rafters have been installed. Leave Roof Framing and visit the mycarpentry home page.